Notes: I was attracted to this short novel for three reasons. First, it only cost me a buck because I discovered it at a used book store. Second, it's Michael Moorcock, and while I've read a fair amount of this author's work, most of that reading has been of his Elric character, and Moorcock has written so much more. 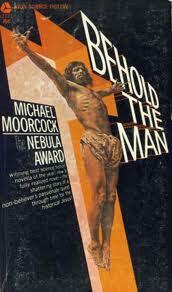 Third, the premise interested me: A time traveler goes back to the past to look for Jesus. Now, I've read the first few pages, and if the story goes in the direction I think it's going then I will be quite disappointed, feeling the tale will turn into one giant cliche. But in all fairness, when this novel was originally published in the mid-1960s, it probably was not a cliche then. I read this book many many years ago and loved it. Yeah, it's going where you think it's going, but Michael Moorcock is Michael Moorcock, and you are correct--this is a book which at the time of publication was something shocking. No one wrote stuff like this which any way questioned the Christian mythos. I think I'm going back and re reading this. Thanks for jogging the memory. Yep, it is going in the direction I feared, but Moorcock is doing some interesting things with the background material. I'm not sure it's exactly a flashback, more like he's writing to separate plot lines that will emerge eventually. Honestly, I'm finding the one set in the modern world (of the 1960s) more interesting, reminding a little of the writings of James Joyce. Lyn, I'd have to say it's probably not for you. It doesn't necessarily mock the faith as much as it attempts to destroy it entirely, even going beyond any mere historical representation, but finally even emotionally and spiritually (at least in the final words of the novel). The last page and its ramifications make this one a dark, dark novel, stepping into existential nihilism. Ah, interesting. Good call, then. I'm open to challenge and engagement, but if a book is simply a diatribe or anti-sermon, I'm not interested. Thus I won't read Pullman. But same goes for a lot of Christian novels - they aren't novels! They're exposition veiled in allegory or typology, which to me isn't very interesting.